Bright yellow, thick walled fruits reaching up to 8in long, with a sweet mild taste. 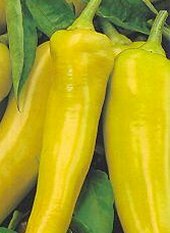 Sweet Banana Sweet Pepper is an elongated, 6-inch peppers. Delightful in salads, exquisitely pungent pickled. Famous for its amazing yields. Sweet or hot, peppers add excitement to any dish. You can fry, roast stuff or grill them, or simply chop and add to salads.